Waiheke Soap Company (along with us, Be Vibrant) is based on beautiful Waiheke Island. Their boutique company is based at Te Matuku bay (within which there is now a marine reserve), where they have worked on regenerating native bush for nearly 20 years. 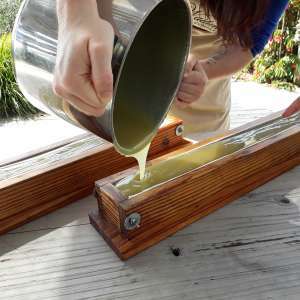 They craft artisan handmade soap in small batches using old fashioned recipes and methods. Hello from long-time islanders, Theresa Murphy and David Harold. We got out of the gas and plumbing business a while back and are now the artisanal soap makers (along with our niece, Michelle) behind Waiheke Soap Company. When not working as a nurse, our niece Michelle enjoys being involved with all aspects of the soap-making process. She is an all-round go getter who helps out and brings her love to what is a family business: sourcing products, making soap and, of course, helping to wrap product when the pressure is on to supply orders. A fantastic support person and overall good sort! David enjoys putting on his engineer’s hat and coming up with ways to streamline the crafting processes. He has made a soap cutter using various bits of wood from around the farm and a selection of recycled guitar strings. Soap cutting is much more fun now as you can almost play a tune while cutting! We enjoy the whole soap making experience and find it really fun! To paint a picture in words of the crafting process: We make our artisanal soap bars using what is known as the ‘cold-process’ method. Once poured into the wooden box moulds, the long uncut rectangles of soap rest for 48 hours before we un-mould and cut the product into bars. But wait (!) that’s not the end of the story; the soap is then air-cured in a well-ventilated area for a minimum of 4 to 6 weeks before it is ready for shipping and sale. This ensures that moisture has evaporated from our product, increasing the hardness of the soap, giving it a longer life in your soap dish. Before we can ship our handcrafted soap bars out to you, the customer, they are all individually hand wrapped by us, with each crisply labelled package topped with a piece of native paua shell. This could be the most satisfying part of the process, we find it quite therapeutic and relaxing!